The image of alchemists as defrocked wizards and full-time frauds is not quite accurate. Most of them were, in fact, highly spiritual men whose quest to transmute one substance into another was closer to mysticism than modern chemistry. The essence of alchemy lay in the belief that certain incantations and rituals could convince or command angelic beings to change base metals into precious ones. According to ancient tradition, the mummy of Hermes Trismegistus, the master of alchemical philosophy, was found in an obscure chamber of the Great Pyramid of Giza, clutching an emerald tablet in its hands. The words contained on the tablet revealed the alchemical creed that "It is true and without falsehood and most real: that which is above is like that which is below, to perpetuate the miracles of one thing. And as all things have been derived from one, by the thought of one, so all things are born from this thing, by adoption." Within the secrets inscribed on the tablet was the "most powerful of all powers," the process by which the world was created and by which all "subtle things" might penetrate "every solid thing," and by which base material might be transformed into precious metals and gems. For centuries, the writings of Hermes Trismegistus were considered a precious legacy from the master of alchemy. The Hermetics believed that the nature of the cosmos was sacramental: "that which is above is like that which is below." In other words, the nature of the spiritual world could be discovered through the study of the material substance of Earth; and earthly humans, created of the dust of the ground, comprised the prima materia of the heavenly beings they would become, just as the base elements of Earth comprised the raw materials for gold. The alchemical adepts believed that the most perfect thing on the planet was gold and that it was linked with the sun. The sun was considered to be the lowest manifestation of the spiritual world and therefore provided the intermediary between God and humankind. The science of alchemy was introduced to the Western world at the beginning of the second century of the common era. It was, however, 200 years before the practice of the craft reached its zenith, concurrent with the persecutions of the pagans by the Christians. 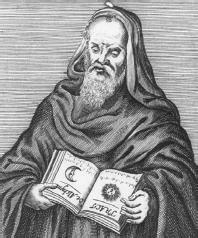 Zosimus of Panapolis, self-appointed apologist of alchemy, cited a passage in Genesis as the origin of the arcane art: "The sons of God saw that the daughters of men were fair." To this scriptural reference, Zosimus added the tradition that in reward for their favors, the "sons of God," who were believed to be fallen angels, endowed these women with the knowledge of how to make jewels, colorful garments, and perfumes with which to enhance their earthly charms. The seven principal angels whose favor the alchemist sought to obtain for their transformation were Michael, who was believed to transmute base metals into gold and to dissolve any enmity directed toward the alchemist; Gabriel, who fashioned silver and foresaw the future; Samuel, who protected against physical harm; and Raphael, Sachiel, Ansel, and Cassiel, who could create various gems and guard the alchemist from attack by demons. However, members of the clergy were skeptical that the alchemists were truly calling upon angels, rather than demons in disguise, and they recalled the words of the Church Father Tertullian (c. 155 or 160–after 220), who confirmed earlier beliefs that the "sons of God" referred to in Genesis were evil perverts who bequeathed their wisdom to mortals with the sole intention of seducing them to mundane pleasures. While the Hermetic was akin to the mystic, a great deal more came out of those smoky laboratories than candidates for the torture chambers of the Inquisition. In the intellectual half-light of the Middle Ages, the brotherhood of alchemy, perhaps by accident as much as design, did produce a number of valuable chemical discoveries. Albert le Grand produced potassium lye; Raymond Lully (1235–1315) prepared biocarbonate of potassium; Paracelsus (1493–1541) was the first to describe zinc and chemical compounds to medicine; Blaise Vigenere (1523–1596) discovered benzoic acid. Discoveries increased during the Renaissance when such men as Basil Valentine (c. 1450– 1492) discovered sulphuric acid, and Johann Friedrich Boetticher (1682–1719) became the first European to produce porcelain. Evidence has been disinterred from the musty alchemists' libraries in Europe that suggests that certain of the medieval and Renaissance alchemists conducted experiments with photography, radio transmission, phonography, and aerial flight, as well as the endless quest to transmute base metals into gold. Caron M. and S. Hutin. The Alchemists. Trans. by Helen R. Lane. New York: Grove Press, 1961. Heer, Friedrich. The Medieval World: Europe 1100 to 1350. Translated by Janet Sondheimer. Cleveland, Ohio: World Books, 1961. Caron, M., and S. Hutin. The Alchemists. Trans. by Helen R. Lane. New York: Grove Press, 1961.